mods4cars SmartTOP hardtop one-touch retraction modules MAZDA - MiataRoadster - Stay tuned with MiataRoadster! Never again stop for your top: with one touch of a button you can open or close the top, even while driving at speeds up to 35 MPH. With the mods4cars SmartTOP hardtop one-touch retraction module installed, the transmission does not have to be in “PARK” to operate the PRHT. Nor do you need to hold your finger down on the dash button for the duration of the retraction. Release the top security latch and just one touch puts the top into motion. 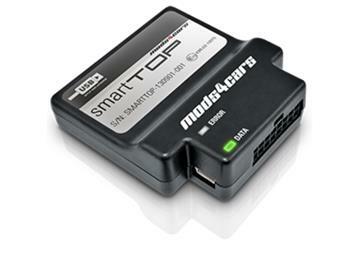 The plug-n-play installation of the SmartTOP module requires no modification of the factory wiring on your car. The SmartTOP module mounts inside the panel behind driver’s seat. Review the owner’s manual showing how simple it is to install the SmartTOP module.